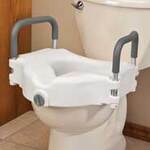 Toilet seat adds 4” of height for easier sitting with less bending. 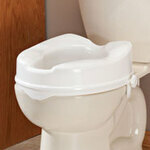 Quick-lock system makes it easy to clean and ideal for multi-user households. Extra wide opening and large front cutout. Supports up to 300 lbs. 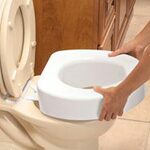 Fits most elongated and standard toilets. 15” long x 14 1/2” wide x 4” high. 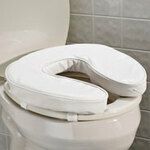 Padded toilet seat cushion distributes weight evenly so you can sit comfortably. 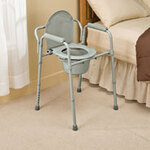 Padded toilet seat secures with straps to standard size 16" seats; available in 2" or 4" thickness. 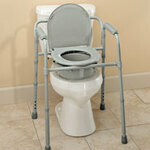 Makes it easier to sit and rise for those suffering with knee or back pain. 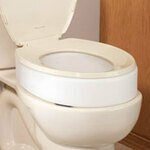 Vinyl over foam toilet seat wipes clean.